The abundant waterfalls gushing out of the craggy relief of Iceland were deeply resonant and inspiring. Godfoss, in particular, inspired Tema to embody its divine expression of the power of Iceland as an island of ice in perma-melt with an at times forceful and at times giggling blood flow of water. This was the first time either of us met face-to-face, touched, and ate like a popsicle a melting glacier. The waterfalls’ enormity and power is emulated in this posture, as is the emotion of taking in the millions-year-old microbes melting in response to our species’ market-driven willful ignorance. Preferably, one takes a pilgrimage to a waterfall, or foss in Icelandic. If no fosses are in the vicinity, doing this posture in an outdoor shower is the second best thing. Standing on one leg, lift the other foot up the inseam of the standing leg until the lifted leg’s thigh is parallel to the earth. Extend arms straight out to the sides laterally mimicking the way the ground has broken into layers from years of plate tectonic movement. Bow the head forward, and, if balance is stable, close the eyes, move the dristi (gaze) inward so that greater focus can be paid to the sound of the waterfall gushing downward called by gravity. This posture was inspired after a midnight, “sunset” horseback ride, in which the rider (pictured) was certain of her impending death or dismemberment as the riders perilously tried to find the signature smooth icelandic horse gait, somewhere between a walk and a trot, called a tolt. The tolt is supposedly so smooth you could drink a pint while riding and not spill a drop. Again, the pictured rider was certain she was being bounced off and was gripping, white knuckled, the saddle and reins while traversing slippery rock mountainsides. Apparently, one is supposed to hold on using one’s inner thighs, hence this pose’s main muscular action is an intense survival-driven engagement of the inner thighs. The Icelandic horse breed has been isolated and bred since the 9th century. This selective breeding and natural selection has created a unique breed that is pony sized with beautiful manes that may inspire romance novel photo shoots, trans-species falling in love, or at least some Fabio jokes. 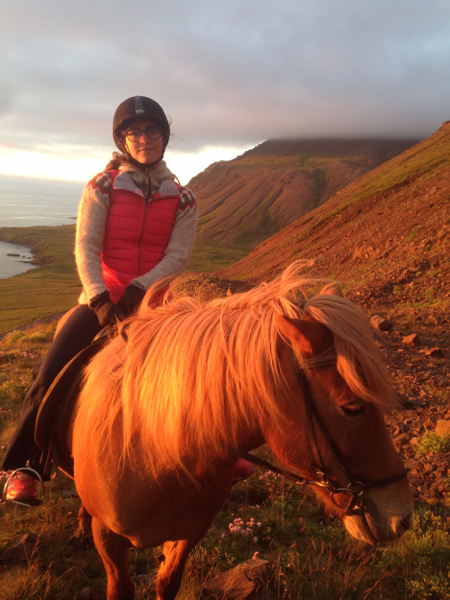 This posture benefits energetically from a three-hour gallop over mountain cliffs and oceanside meadows during a perpetual arctic sunset (the sunlight never actually disappears at night in the summer, see sunset pose) with an icelandic horse. When circumstances do not align, you will likely not attain enlightenment/elation from this posture, but you will attain firmer inner thighs. Position legs in as wide of a squat as you can tolerate, typically the width of a horse. Slightly turn out the feet. Bending at the knees, draw the hips backward as if to sit on a saddle. Engage inner thighs to support the weight of the body, or to keep from falling off of the horse. Make sure to wear proper attire such as waterproof wool ski pants from the ‘70s, an Icelandic wool sweater, and a protective helmet. Both of these depicted variations of whale pose are inversions, only to be attempted by the advanced yogi or whale watcher. The first version (Whale Pose 1) is a forward dive. The yogi joins their elbows at the solar plexus to act as a fulcrum, or launching point of the posture/dive, and balances on their hands and chin. Be careful if you are allergic to grass, as Maggie is, because your face will be inhaling deeply its aromas. To dive, place hands and tip over the fulcrum of the elbows launching your whale tail into the sky. Separate your feet to mimic the flukes of a whale’s tail. Much like horses in Iceland, Icelandic sheep have a long pastoral history. Fun fact! Or not so fun, actually, is that due to animal husbandry practices imported from Europe with the Vikings in the 9th Century, Icelandic forest and wildlands were destroyed in the conversion to grasslands for the grazing farm animals, effectively destroying 90% of the forests and 40% of the topsoil (McGoverns, 2007). There are efforts right now to reforest the land, called afforestation in Iceland. But back to the sheep, the sheep like the horses are unique to Iceland and are their own breed. They are cultivated largely for their wool, which everyone wears in their sweaters called lopapeysa. You can buy them online for a mere $200-500 USD or you can go to Iceland and raid thrift shops (as we did) getting them for a fraction of that cost, averaging $50. Or better yet, learn to knit or befriend an Icelandic granny. One member of our group is very into Icelandic sheep and their wool, and her work there revolves in part around the sheep, so our bathtub was often full of wool in various processes. We learned about the ‘leader sheep’ a specific type of Icelandic sheep that has excellent leadership abilities. These leader sheep can sense impending snowstorms and will lead the rest of the herd home in dangerous situations -- they have been known to save Icelandic humans, as well, who get caught in a blizzard and follow the sheep home. Icelandic sheep also roam freely without fences, so when driving or walking the land, you come upon sheep most everywhere. We were especially impressed with their ability to rest and sleep wherever they wished -- highway shoulder, steep mountainside. This was the inspiration for sheep posture. Sheep pose is a restorative posture. It is recommended that one simply collapse on one side or the other, as if to nap in a bed of long grass, or better yet, really do collapse for a nap on a bed of large grass. Nap or rest for as long as necessary to feel fully restored. Repeat on the second side for balance. 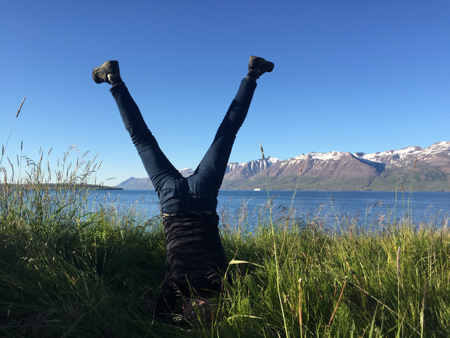 This pose embodies the ocean streaming in and out of the fjord, walled by mountains. Fjords are a common sight as one traverses the ring road in Iceland, a road that many travellers traverse that circumnavigates the circumference of the island and takes about a week to complete. We thought we would eventually grow numb to the beauty and drama of the landscape, but to our delight, the land and the water, and where they met, only grew in us, casting spells, shaping our waking and dreaming lives. Spread your legs wider than hips distance apart. Extend arms forward from your shoulders and bring palms to touch. Fold forward at the hip creases and reach the arms (the ocean water) through the legs (surrounding mountain sides), as far as you can. This posture provides an inverted landscape, where the sky becomes sea. It also gives the road weary a great back stretch before getting back to driving. This pose arose as a response to the many tunnels we drove through passing from town to town along the ring road and the outlying roads. The town of Siglufjordur only became accessible from the east when tunnels were drilled through the mountains in 2010. Iceland’s tunnels are so long, do not attempt to hold your breath -- they can take up to 10 minutes to drive through. It gives one the sense that you are deep underground, which you are. The tunnels can be claustrophobia inducing and can lead to panic when headlights approach as most of the tunnels are only one lane. You, and a string of trailing cars, must pull to the side in the designated car pullouts to safely await the passing of oncoming traffic. As you enter and traverse this complex circuit of human underground ant-like engineering, you feel as if you have been forcibly submerged into a deep internal meditation. Therefore one should do this posture with one’s eyes closed. Outward Tunnel Pose: Stand with your feet hips distance apart. Fold forward at the hip creases crossing your arms to reach for opposite feet, or wherever on the legs is comfortable. Close eyes and breathe deeply. 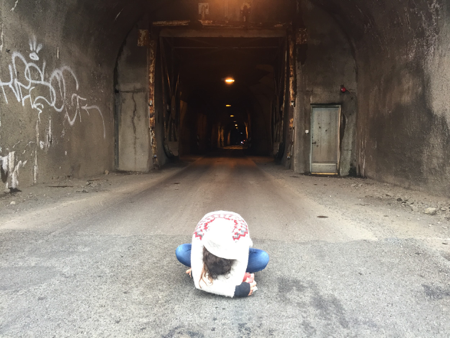 Inward Tunnel Pose: It is now time to ‘enter’ the tunnel of your mind and inner landscape. Keep ahold of your feet if possible as you bend the knees and compress yourself into a seated forward fold, with the legs and arms crossing. Breathe with eyes closed for an extended period of time as you attempt to draw the awareness inward, deep within the mountain, and limit outward sensory inputs. On one of our last nights in Siglu, a local informed us of a beautiful “sunset” lookout. However, in Iceland summers there are times when the sun never sets, it dips down to the horizon, maybe even for a moment below and then immediately begins its ascent. As a center Earther, Maggie had decided to take a time lapse video. This was a bad idea considering how long the “sunset” actually lasted (depending on how you defined it, 1-3 hours). Maggie and some fellow collaborators had to hold their phones completely still, stand in a warrior stride, and hold their hands out energetically to avoid shaking the camera, which of course inspired this pose. Begin in a shortened warrior stride; place one foot forward, the forward knee is at a slight bend to transfer some weight forward while stabilizing with the back leg. The back foot is placed about 2 feet behind the forward foot, foot slightly turned out for stability. Hips and heart face forward toward the Arctic sunset. Arms extend straight forward to hold phone steady. Have the phone on time lapse to challenge your stability and muscular endurance. Gaze is focused on your phone’s video capture but can fluctuate between the phone and the actual sunset. The sun in its seemingly infinite life-giving power can etch itself permanently into your eyes so be cautious. as you gaze upon the neverending setting sun.